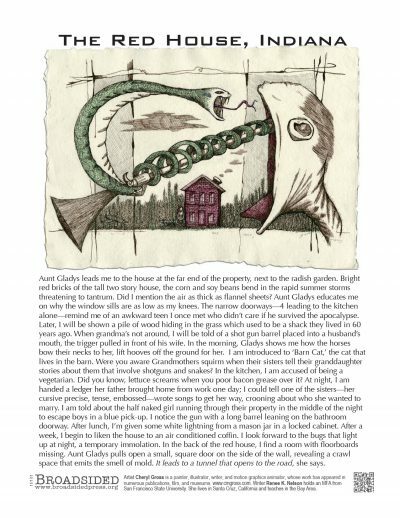 Writer Renee K. Nelson: Perhaps because of the title and the shape of the poem, I figured the artist would focus on the red house and make it the center piece. Besides the house, though, I wasn’t sure how or if he/she would incorporate all of the images/traumas in the poem because there are so many of them. Now that I see the artwork, the snake and the gun seem the most appropriate, the most representational of all the traumas in the poem. The gun and the snake represent the poem in a way the house doesn’t. Although a house can contain these images, they remain somewhat hidden inside the walls of the house. But the poem pulls them out of the house and makes them visible and vulnerable to the world. The art works in a similar way, pulling out them out and putting them on display. Artist Cheryl Gross: I love the fact that the poem is dark. It makes for a more interesting experience in terms of coming up with images. Writer Renee K. Nelson: It made me aware of a reader’s internal processing of all the different images and traumas in the poem. I was ecstatic to see the different images and traumas not only working together, but blending and contributing to each other in the artwork. The snake is pulling the trigger; the person isn’t really a person but a strange caricature/monster/goblin of a person; the house sits in the back, like a cartoon. The artist’s cartoon-like portrayal of the individuals, places, and traumas animates them in their own little world, their own reality and logic, like they exist in a cursed Wonderland or Saturday Morning Cartoon. The combination of the snake curling around the gun in the suicide position working together made me also liken it to a picture or graphic on a flag, a symbol that represents a cursed people and place that exists like a fairy tale world exists. The artwork exposes that world in the most real way it can. Artist Cheryl Gross: I was as always pleasantly surprised at how well the image works with the poem. Writer Renee K. Nelson: I honestly thought the artist would do the expected and focus on the house and nothing more. Pleasantly surprised, I saw this strange world with all the traumas participating together. Artist Cheryl Gross: When I read the poem I envisioned the illustration immediately. First thing that came to mind was the snake wrapped around the barrel of the gun in the person’s mouth. I thought the coil effect would work nicely in the composition. It adds movement to the artwork. Writer Renee K. Nelson: I tend to write about events and people. Many of my poems are character profiles of people, experiences, traumas, etc. I haven’t yet written a poem in response to art yet. If you had to represent the Broadsided of “Red House, Indiana” with one word, what would it be? Writer Renee K. Nelson: I’ve been reading a graphic novel Blankets, and a Sci-Fi poetry anthology, Inside Outer Space, edited by Robert Van Dias, I picked up at a used bookstore. I’m in the middle of designing a lesson plan for my English course and I’m teaching Push by Sapphire. Artist Cheryl Gross: Just Kids by Patty Smith. Writer Renee K. Nelson: I recently purchased a painting by Scott Jacobs, a young artist in Carmel, CA. Artist Cheryl Gross: I teach at Pratt Institute, so I’m always seeing great art. Lyonel Feininger at the Whitney is a great show. Artist Cheryl Gross: The greatest and most rewarding experience I have had with Broadsided is my collaboration(s) with Nicelle Davis. We have worked on several projects together, awaiting the publication of 2 books, and our motion graphic trailer for the book Circe was just reviewed in A cappella Zoo. Writer Renee K. Nelson recently received her M.F.A. in Creative writing from San Francisco State University. Her poems have appeared in Transfer, in which her poem “Intermission” won the Mark Linenthal Award for poetry in 2010, Gone Lawn, Ping Pong, Hamilton Stone Reviewand Porter Gulch Review. Currently living in Santa Cruz, California with her two cats, she teaches composition in the Bay Area. Artist Cheryl Gross has an MFA in New Forms from Pratt. She writes: “When asked about my work, I always equate it with creating an environment transforming my inner thoughts into reality. Much like an architect or urban planner, that reality and humor becomes the foundation of the work. Beginning with the physical process, I work in layers. Born and raised in Brooklyn, New York, my urban influence has indeed added an “edge” to my work. Coming from a totally vertical and intense environment, I now live in Jersey City, NJ.” www.cmgross.com. Image: “The red House, Indiana,” 12″ x 17″, handmade paper, ball point, graphite, India ink.